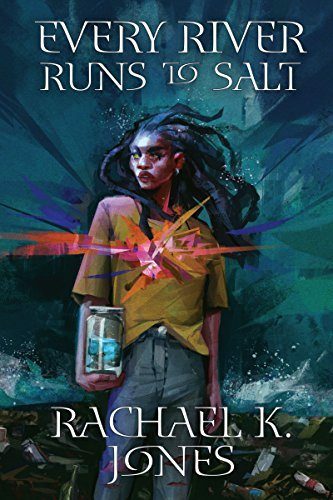 Every River Runs to Salt, Rachael K. Jones’s debut novella, impressively hangs a rich network of themes on a very simple plot. It’s also very funny. In the course of the novella, the protagonist Quietly’s college roommate and crush, Imani, steals the Pacific Ocean because she wants people to appreciate its beauty—and to take notice of the great, horrible garbage patch in the middle of it. After she steals the ocean, personified caricatures of California, Oregon, and Washington—which Jones collectively dubs “Hypotheticals”—appear at Quietly and Imani’s door, demanding their ocean back, and bestowing “gifts” on the latter which function as curses. “I'm Oregon.” Her voice sounded like young, proud mountains full of wolves. I hated her instantly. “Great. We have your ocean right here.” On an impulse, I spun around to take the jar from Imani, but it was like depriving a lifelong smoker of their last nicotine patch. Imani held the jar like a football and bodychecked me with her hip. I bear-hugged her, reaching toward the jar, but her arms were longer. After an awkward scuffle, Imani broke away and charged outside and down the street. I followed after, Oregon tailing us. Oregon shouted something at us. Turned out her voice really was full of wolves. A whole pack tumbled from her mouth onto the sidewalk and howled. Huge fir trees broke through the pavement and crashed through parked cars. The whole street sloped up, up, and up to a convex horizon, and a deep volcanic growl rumbled from its apex. The phrase “young, proud mountains” is fresh and evocative, and the revelation that Oregon’s voice not only sounds full of wolves but quite literally is full of them adds genuine wonder to this entrance while also making me laugh. Humor also comes from Quietly’s reactions and commentary, juxtaposed with these descriptions. The harsh snap against this poetic description of “I hated her instantly” is perfect. Jones also renders the physical gestures of characters sharply and vividly: “bear-hugged her, reaching towards the jar” is especially good. Remarkably, each of the three Hypotheticals that appear in this section of the book are equally cleverly written. At the conclusion of the novella’s first act, the final Hypothetical to come for the Ocean gives Imani the “gift” of abandon. Her increasingly over-taxed young body crumbles to salt. In the second act, Quietly grieves, graduates from “The University,” and discovers secret messages from Imani. In the third, following in the footsteps of Orpheus, Quietly journeys to the “Under-Ath”—a dark, wet, dirty secret of a city under Athens, Georgia—to get her beloved Imani back. The story is eventful, then, but also meditative. Quietly’s musings are as surprising as the descriptions of the Hypotheticals chasing her down the street. She reflects on the Oconee river, named with a word which means in translation “the water beside the land beside the water”: “something Biblical about that, like a powerful woman named for a man. Adam’s daughters. Lot's wife. Oconee, Oconee.” The way in which Quietly elaborates on what might be the otherwise commonplace “something Biblical” took me pleasantly by surprise. I sucked on my dry teeth. That tea was the first liquid of any kind I'd seen in the Under-Ath. He glanced at me over cracked spectacles, and a smile poured across his lips like warm honey. Almost pleasant, except that smile squeaked so loud I clenched my jaw. Oh, and by the way—his flesh is filled with crickets instead of blood. But once you’ve got a smile that creaks, that’s just icing on the cake. “I don't trust the University. They work for the Oconee River, and we all know where that leads,” Imani muttered. Imani and Quietly face a problem that cleverness, and an understanding of how the story’s world works, can’t solve. Problems and solutions are created emotionally and resolved that way, too. “What about the University?” is a lawyer’s question, a problem-solving query, and could be met with any number of answers—all of which would echo with cosmic finality and which would boil down to the fact that they are not the emotionally correct solution. In fact, the role of the University—how it works, what it is—is never fully explained. It, too, seems more an idea than a real place. I don’t mind this way of writing. I’d even say I like it. In this novella, however, the technique has a distancing effect for me. A little more understanding—not of the “rules” of the world per se, but of what it is like when we pan out—would in my reading have helped this story feel more substantial and affecting. For example, Kai Ashante Wilson, one of my favorite novella writers, attempts similar tonal effects in The Sorcerer of The Wildeeps and A Taste of Wild Honey (2015), but is more effective at rooting them within a lived in world of their own. We hear about where Wilson’s protagonist in The Sorcerer of the Wildeeps came from and what his life has been like before, what his daily struggles are. In Jones’s novella, on the other hand, we merely hear a bit about what Quietly and Imani do with their time: Quietly indulges in Pride and Prejudice marathons with Imani, eats popcorn, goes to coffee shops, and gets chigger bites at the Okefenokee Swamp tagging herons. But to me, these details work more as signifiers of “the real world” and “normal life” than as information about what it’s really like to go through the world as Quietly or Imani. Unsettled, I went for a stroll, rounding Steeplechase to where the Oconee Greenway lapped against our back door, near the crumbling steeple where R.E.M. practiced before they got famous. Say what you will about the Oconee River: it has none of the Pacific's martial nature. The Oconee rolls soft as a guest too polite to take the last cornbread square. Even its name dissembles. Jones deftly engages all of my senses with this description. But here, again, we are closely focused-in on one specific image that Jones wants us to see and feel. The broader sweep of Quietly’s world remains a little out of focus. There are extremely lovely character moments, but I feel that if I could have understood a little better what these characters’ lives were like in all their particulars, how they ticked and how their world operated, I might have cared more deeply about Quietly’s relationship with Imani. Notably, this style of writing is quite different from Jones’s short story “Charlotte Incorporated,” which Jones herself describes as “a weird posthuman science fiction piece about upwardly mobile brains in jars.” That short, tight piece feels much more “world-built” than Every River Runs to Salt. This contrast confirms for me what I would have guessed—that the lack of worldbuilding (for lack of a better word) is a deliberate choice from a very skilled and versatile writer. Some may embrace Jones’s decisions here more unequivocally than I have. They certainly allow her to achieve a series of plot beats that otherwise might have rung false. It is a uniquely and beautifully told story, and I am truly looking forward to seeing what Jones does next.